​Mary Pardoe – Second Fleeter on the Lady Juliana, 1790. Mary was convicted of theft and sentenced to seven years transportation on 2 April 1788 at the Warwick Assizes. She was listed as 18 years of age on the embarkation list for the Second Fleet transport Lady Juliana. With Mary was her baby daughter Ann who had been born aboard the Lady Juliana two days before it had anchored in Port Jackson on 6 June 1790 after a voyage of 10 months. Ann was christened in Sydney on 20 June 1790. She had been fathered by a seaman aboard the Lady Juliana, Edward Scott, who was sent back to England with his ship on 25 July 1790. Mary Pardoe was sent to Norfolk Island as a single mother. Mary was soon in a relationship with Peter Hibbs, and Ann was given his surname and raised as his daughter. In February 1791, many of the crew from HMS Sirius were shipped back to Sydney - Hibbs stayed on the island to be with Mary. In the 1806 muster and confirmed in later censuses, Mary Pardoe is recorded as the "wife of P. Hibbs". It is assumed that Peter Hibbs, about 10 years older than his bride, married Mary Pardoe in November 1791 when Rev. Richard Johnson visited Norfolk Island for three weeks and married many couples (no records were kept). Upon their marriage, Peter Hibbs became my 7x step-great-grandfather, cementing the family relationship through Ann Scott/Hibbs. According to family sources he was short and stocky, smoked, never learned to read and write and, unusually for a British seaman, could swim. Ann Scott was known as Ann Hibbs while living on Norfolk Island. Ann married John Izard (who was from Kingston-on-Thames, Surry, 15 years her senior) who arrived as a convict 1802 on board convict ship Perseus. One of their daughters, Mary Ann, married convict Joseph Delandre who arrived from Ireland after being accused of stealing a gold ring - believed to have been a set-up as his father was a goldsmith in Dublin. Three generations of the Delandre family had lived in Ireland, at one time residing in Waterford, Ireland's oldest city with strong Viking and Norman influences, and world-renowned since 1783 for the crafting of elegant crystal creations. Their lineage came from French Huguenots who fled France about 1695 (French surnames allied with Pardoe - Purdy, Pardue, from the oath ‘pour Dieu’ which is Old French meaning "for God"). Mary Ann died after childbirth aged 37 years. She was first female to be buried Wollombi. Her eldest son, Joseph Delandre Jnr, married to Dorothy Byrne who were parents of my great-grandmother, Dorothea Welch (nee Delandre), who in turn was mother of my grandfather George Welch. Dorothea & George Welch Snr were parents of my grandfather George Welch Jnr who was my mother's father. Peter, the son of Mary Kenney, was born c. 1757 (according to his gravestone) at Ramsgate, Kent, England. On 25 December 1760 at the parish church of St Laurence-in-Thanet, Ramsgate, his mother married George Hibbs of Swanage, a seaside town in Dorset. Peter was raised as George Hibbs' son and was given his surname. The family moved the 200 miles (320 km) back to Swanage. On 24 January 1762, Peter was baptized at the parish church of St Mary the Virgin, Swanage, as Peter Kennel [sic] Hibbs, the son of George and Mary Hibbs. Hibbs maintained during his life-time that he sailed on HM Bark Endeavour as cabin boy for Captain James Cook. This would have made him about 11 years of age when the Endeavour departed from England on 26 August 1768 on Cook’s first voyage of discovery. On anchoring at Botany Bay on 28 April 1770, Hibbs also claimed that, after Joseph Banks the naturalist was set ashore, he was the second person to land on the beach. These claims were repeated in the newspaper the Windsor and Richmond Gazette of 3 May 1890 on the death of his son, Peter Hibbs Jnr. During the 18th century the Royal Navy encouraged boys as young as nine years of age to enlist as "servants." Cabin boys performed a variety of functions such as errand boys, servants to officers, mess attendants, and on armed vessels as powder monkeys. They were also apprentice seamen "learning the ropes" as they underwent sail training on the rigging. Since they were under-age, their names were often not recorded on the ship’s manifest. Hibbs’ British Navy career commenced on 24 August 1786 when he was appointed as an able seaman aboard the 74-gun battleship HMS Goliath. Less than a year later on 25 March 1787 Hibbs was transferred at Captain Arthur Phillip's request to the 136-gun ship HMS Sirius, the flag ship of the First Fleet. Hibbs was 31 years of age when the First Fleet arrived at Sydney Cove on 26th January 1788. HMS Sirius departed on 2 October 1788 for an arduous voyage to Cape Town to secure much needed supplies for the Colony. Hibbs was among the crew to complete the first circumnavigation of the globe in an easterly direction, taking advantage of the strong westerly winds but running the risk of icebergs in Antarctic latitudes. 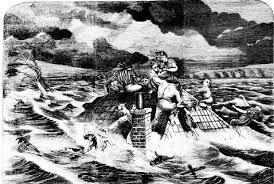 On the last leg of the voyage a gale nearly drove the ship onto the Tasmania coast, smashing the ship's figurehead and badly damaging the front of the ship. Only the mastery of Captain John Hunter and his exhausted and scurvy afflicted crew saved the ship from destruction. On its return to Sydney on 8 May 1789 after a seven month voyage, the Sirius was careened in Mosman Bay to repair the damage. In June 1789, Governor Arthur Phillip led an expedition north which resulted in the discovery of the Hawkesbury River. From stories that his father told him, Hibbs' son, Peter Jnr, claimed that Hibbs Snr was chosen by Governor Arthur Phillip as a crewman for this expedition, and at that time Hibbs "took a fancy to a piece of land" which he was later granted. Salvaging operations at the wreck of the Sirius at Norfolk Island, using hawser and traveller. In March 1790 HMS Sirius, with a crew of about 130 including Peter Hibbs, and the HMS Supply, sailed to Norfolk Island carrying marines, convicts and children, livestock and supplies for the settlement. Bad weather delayed unloading until conditions were calmer. Unfortunately the ship drifted too far into the bay on a fast running flood-tide and was wrecked on a reef on 19 March. On 24 March 1790 HMS Supply sailed into Sydney with news of the wreck carrying twenty-two of the crew from HMS Sirius. The remainder of the crew were left on the island - Hibbs chose to stay on the island. The situation on the island was now critical, with 400 extra mouths to feed. In desperation the settlers began harvesting the local Mount Pitt birds, christened the "Providence" petrel. Justinian and Surprize ​from the Second Fleet were able to bring some supplies to avert absolute starvation. It took eleven months after the wreck for a ship to be sent to Norfolk Island (February 1791), to carry most of the crew back to Sydney. Hibbs’ perilous rescue from the wreck was by scrambling along a traveller and hawser to the shore - fortunately he was able to swim. His next months were spent involved in the wreck’s salvage operations, while suffering the same deprivations as other settlers on the island. In early August 1790 the Second Fleet convict transport Surprize arrived at Norfolk Island carrying 150 female and 35 male convicts and some more supplies. Among these convicts was Mary Pardoe. ​A new chapter in the life of Peter Hibbs now began on Norfolk Island. He was granted Lot 54, a 60 acre grant of land on the south side of the Cascade Run at Phillipsburg – 13 acres hilly and 47 acres level, all of which he could plough. He soon had 9 acres under cultivation and in October 1793 sold half of his 60 acres to Aaron Davis for £30, but was still selling grain to the government stores in 1794. In 1792 Mary gave birth to Peter Hibbs' first son, George, named after Hibbs' father. George was to be followed by Peter in 1794 who did not survive his infancy, and Peter Kenney Hibbs Jnr in 1800. These three boys were all born on Norfolk Island. Mary and the children moved to Sydney in January 1804, with their son William being born at sea on-route between Norfolk Island and Sydney. ​Hibbs played a significant role in the exploration of Tasmania and the eastern seaboard of Australia. Hibbs was appointed as master of a colonial built vessel, completed in 1798 on the orders of Captain John Townson, commanding officer of Norfolk Island, the aim being to establish regular contact between the island and Sydney. Using salvaged timber from the Sirius wreck, Hibbs assisted with the building of a 25-ton decked sloop called the Norfolk. Hibbs sailed the Norfolk to Sydney in June 1798 with a crew of men from the island. On arrival the boat was confiscated as the Governor had enacted a law against boat-building which might give convicts the means to escape from the colony. Governor Hunter formally appointed Hibbs as master of the Norfolk and was charged in 1798-99 with sailing Lt. Matthew Flinders and Surgeon George Bass on a voyage to establish that Van Dieman’s Land (Tasmania) was an island. 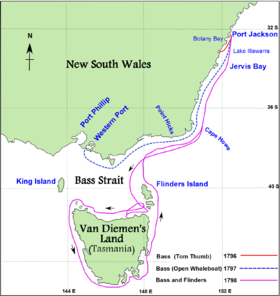 This was the first vessel to circumnavigate Tasmania with Bass and Flinders proving the existence of Bass Strait thus establishing it was not attached to mainland. This subsequently shortened the travel distance from England to Sydney as ships no longer had to round the rocky shores of southern Tasmania to reach Sydney. Flinders being rowed ashore at Bribie Island. Inset: Bungaree (left) Flinders (right) from a painting by nautical artist Don Braben. ​Mid 1799 Peter Hibbs sailed the Norfolk on another expedition to explore the southern coastline of Queensland as far north as Hervey Bay. Leader of the expedition was Matthew Flinders who was accompanied by Bungaree, a member of the Sydney-district Eora people, hopefully to communicate with local Aboriginal people. Another 'crew' member was Trim, Flinders' intrepid cat who, until his pet's death in 1804, shared all of his master's extraordinary achievements. Flinders landed on Bribie Island (unaware that it wasn’t the mainland), but their progress was delayed to repair leaks in the boat. To get a view of the area, Flinders scaled Mt Beerburrum in the Glass House Mountains that rise abruptly from the coastal plain on the Sunshine Coast, Queensland. Hibbs steered the Norfolk into Moreton Bay (then named Glass House Bay) and progressed slowly so Flinders could explore and chart the bay’s expansive waters. 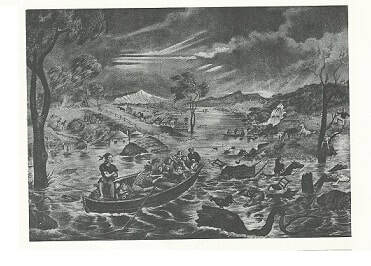 Flinders hoped to discover a large navigable river that would lead into the inland but, with the multiple bays and inlets, Flinders did not discover the Brisbane River. In October 1800, while the Norfolk was being used to carry locally grown produce from the Windsor area on the Hawkesbury River to Sydney, the ship was wrecked after being hijacked by convicts - Hibbs was not master of the ship at the time. By September 1800 he was listed as being "in care of His Majesty's Ship Supply”. Hibbs then joined the armed vessel HMS Porpoise in 1801 as Quarter Master & Masters Mate. Serving with Hibbs was his young son George. Hibbs was discharged from the Porpoise at Sydney in August 1803. When Peter and Mary left Norfolk they moved to Hawkesbury area. Hibbs was one of the first non-convict First Fleet members known to have settled in the area. To support his family Hibbs became a part-owner of the Trimmer, a small 20 ton sloop, which he sailed between Sydney and the Hawkesbury River, servicing the farms established there. On 11 August 1804 Hibbs was granted 100 acres at Mulgrave Place, on the Hawkesbury River, where he established his growing family. His young son George was granted the adjoining 100 acres. The farm was situated on the first branch of the river and bounded upon both sides by the water, with extensive frontage of about two miles on the south side of the Hawkesbury River. It was known as "Hibbs' Farm" even after Hibbs no longer owned it. ​Hibbs was eventually made bankrupt by the devastating floods of 1806 and 1809, appearing before the courts for debts to his creditors. The first occasion was on 26 March 1810 for owing money to Henry Kable Jnr. As a result an order was made against Hibbs. "A Quantity of Houshold Furniture, a few Pigs and Goats, and other Effects,...Two Stacks of Wheat and about Four Hundred Bushels of Bread Corn" belonging to Hibbs was sold by the Provoct Marshall at public auction on 17 May 1810. Hibbs was again before the courts on 24 July 1812 for owing money to Thomas Brady, and on 28 October 1812 for owing money to Mary Reibey. As a result in October 1812 Hibbs sold his 100 acre grant at Mulgrave Place to Mary Reibey for £100. However he again found himself before the courts on 30 April 1814 for owing money to Henry Kable Snr. The Recovery, Peter Hibbs owner, on her passage from Hawkesbury with grain about a month since, was blown out to sea, and at length wrecked near Port Stevens due to tempestuous weather. Hibbs had to walk with his crew, his son George, and a female passenger about 80 kms south along the coast to the nearest settlement at Newcastle, but on the way they were stripped of their clothing by natives, exposing them to cold winter weather. The group obtained passage on the sloop Windsor, but Hibbs, George and his passenger were again wrecked at Long Reef (near Collaroy Beach) and again the group had to walk along the coast until they could secure a further passage to Sydney. 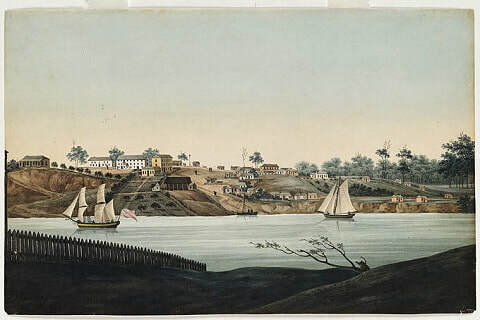 In 1821 Hibbs received another grant of 60 acres of land at Courangra Point at Haycock Reach, Hawkesbury River. The deed for this land was not registered until 30 June 1823. This was land that Hibbs had already been permitted to occupy. As he was illiterate, previously he had a Memorial written on his behalf requesting ownership of this land. In this Memorial dated 30 June 1820, Hibbs stated that he had arrived on HMS Sirius, had been Quarter Master and Master's Mate on HMS Porpoise, had a wife and 7 children, and had already built a home and had sewn 14 acres in wheat. In 1821 his son Peter Jnr also received a grant of land having requested the same on 28 June 1820, stating in his Memorial that he had reached the age of 21 when he had not in fact yet reached that age. Both Peter Snr and Peter Jnr became entitled to receive a further grant of land in 1825. In the 1822 NSW muster, Hibbs, Peter Jnr and William are all shown as Landholders in the district of Windsor. His wife Mary is recorded as Mary Pardo, employed by P Hibbs, Windsor. In 1824, Hibbs "Of Lower Branch, Hawkesbury; mariner" was on a list of persons liable to serve as jurors in the District of Windsor. 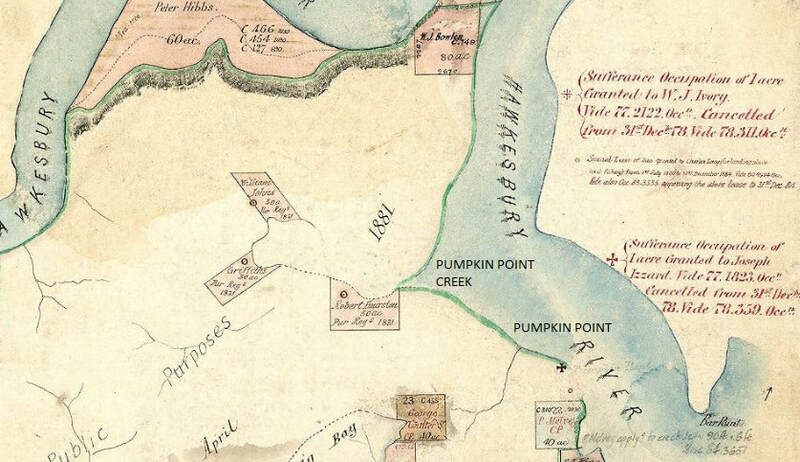 An old Marramarra parish map with locations of Pumpkin Point, Pumpkin Point Creek and Hibbs Farm on the curve of the river coloured in brown. In the 1825 NSW muster Hibbs is shown as a Landholder in the district of Wilberforce. His sons Peter Jnr, William, Richard and Joseph are also shown with their ages accurately recorded. His wife Mary is recorded as Mary Pardo, wife of P Hibbs, Wilberforce. sixty acres more or less, situate, lying, and being, in the county of Cumberland and district of Castlereagh, bounded on the north, east and west sides by the HAWKESBURY RIVER, and on the south side by mountains. Hibbs' wife Mary died on 19 May 1844. Hibbs survived her by 3 years, dying on 12 September 1847 at Pumpkin (Creek) Point on the Hawkesbury River, aged 90 years, where his step-son-in-law John (aka Joseph) Izard owned an acre of land. Peter and Mary Hibbs are buried in the Wisemans Ferry Cemetery, Singleton Road, Laughtondale, NSW, close to the Marramarra National Park. The area that was then known as Lower Portland Head. Submitted by Jennifer Thatcher - user name stives02; Derek Dillon, grandson of John Delandre and sibling of Dorothea Welch (nee Delandre) our mutual great grandmother, has completed extensive research on our family forebears, available on Ancestry Ancestry public trees.